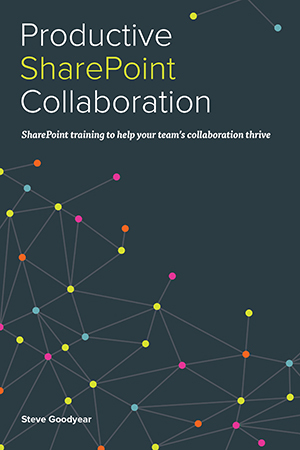 Productive SharePoint Collaboration is my free SharePoint training guide for beginners, offering step-by-step guidance for common SharePoint team site collaboration tasks. Or, if you prefer to hold an actual book in your hands, you can order print copies from Amazon. I hope you find it valuable and get a lot out of it! You can also preview the entire book online through Google Books (although the formatting might not be as crisp and as polished as the other options). Please let me know what you think of the book. You can share your thoughts by leaving a comment below or by sending me a tweet on Twitter @SteveGoodyear — I’d love to hear from you! Thanks, this I great. 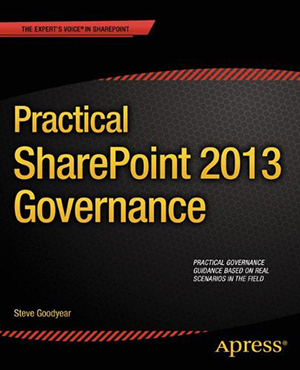 I read your other books, and they have been helpful as I have been the unofficial 365 rollout guru and staff liaison for al things SharePoint and now Yammer. Thanks Lisa! It feels nice to hear you’re enjoying my books and find them helpful. I hope this book helps you support your users in your rollout. Thanks.. Do you have any way to download as pdf? I hope to read this book from my laptop. Hi HongWoo – Google Play allows you to read the book through your browser. It works great actually. Or you can also download a Kindle app for Windows and Mac and read your books on your laptop using that. not free :(! we must inform a bank card to dowload it in google play :(! Hi Salomon, It is free. Google still considers it a transaction even though it doesn’t charge you credit card. It requires this information to confirm your identity and country of residence — you need a Google Wallet for free music or magazines or any other content as well unfortunately. It isn’t a setting I can control nor do I have access to it, as all the distributors will require you to have an account to access any content. Any chance of getting a PDF copy? Hi Arnold, unfortunately I only published a digital version in the e-reader format, but the Google Books offers a good compromise with the entire book online. Are there free PDF downloads of the books so I can read it on my PC? No problem! You can also look for the free Kindle app from Amazon or a Chrome app from Google. Those are available for most modern desktops. Thank you so much for sharing this helpful formation!! I have been tasked with a ShatePoint Online project and am really, really concerned. We don’t have any version and have no experience with ShatePoint, yet my boss has assigned me as the project manager. 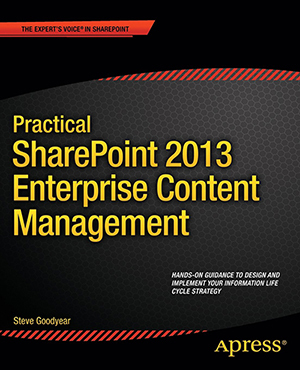 I’ve taken a couple of courses, but that in no way has prepared me to manage a SharePoint Online project. Is it possible to “tailor ” your phased approach to a SharePoint Online project? Have you posted any articles, etc. about SharePoint Online? Again, thank you.